Shortly before the War Requiem’s 1962 premier, Benjamin Britten decided he needed to have a look at the newly rebuilt Coventry Cathedral. It had been commissioned there and was the designated venue for first performance. It is sited dramatically adjacent to the ravaged 14th-century building, just a hollow shell after the devastating 1940 German air raid that destroyed not only the cathedral but most of the rest of the city. This was Britten’s first visit to the new building, and he was shocked. He disliked the look of it and called the acoustics “lunatic.” So much for smooth sailing. And that was just the prelude to a series of problems—clerical, logistical, technical, and, oh yes, musical—that were unfolding, or about to, as perhaps the inevitable sidebars to the birth pangs of a unique masterpiece. One assumes that the Boston Symphony faced somewhat fewer of the kinds of hurdles Britten faced in his first performance as they prepared for Thursday’s first-of-three readings this week for one of Britten’s and the last century’s, finest musical achievements. But there surely are obstacles to be faced and conquered in any revival of this massive work. The demands on talent and technique for the performers are enormous, bigger perhaps, at least in a transcendental sense, than the walls of any concert hall can contain. As a performer and as a listener, one lives this music. Anything less is failure. The message is there, but it communicates first through precision, then passion. As fine music teachers have told their students for generations though: It’s all in the notes. The War Requiem is a full Latin Mass of the Dead into which are interleaved selections of the anti-war poetry of Wilfred Owen, who himself was killed in the very last week of the Great War, in 1918. Owen’s poems left an indelible impression on Britten, as they do on all who read his battlefield reflections: ugly, heart wrenching images of the dead and dying captured in words of unforgettable, pained beauty. Not for Owen the “nobility” of a trench warfare death in service of a hallowed “God and Country” tradition, even if as eloquently expressed in the words of other war poets, such as Rupert Brooke’s “Blow out, you bugles, over the rich Dead!/ There’s none of these so lonely and poor of old,/ But, dying, has made us rarer gifts than gold.” Contrast this with Owen’s, “What passing-bells for these who die as cattle?” This is the first line outside the Mass text one hears in the War Requiem. Musically, the War Requiem is based on the simplest of devices: two notes, a C and an F-sharp, the nettlesome tritone that demands resolution, which in this work remains intransigent of that resolution (intentionally, of course) most of the time. We are introduced to these two tones that carry so much tension at the very beginning. The chorus murmurs, hardly audibly, as if from afar, Requiem aeternam. Quietly, the first F-sharp bell sounds, then the C. The orchestra joins with the chorus in a solemn dirge that grows in intensity (fury?) until both subside to allow the boys’ choir to enter with their almost jaunty chant, Te decet hymnus (you are praised, God, in Zion). Underneath them the reiterated C and F-sharp are taken up by the orchestral violins. As the boys reach the final line of text, ad te omnis caro veniet (to you all flesh will come) the chant breaks down and the boys, first in monotonic dialogue, then singing in parts on C and F-sharp sing and reiterate, Ad te…. ( to you…..), after which the first of the Owen poems, the one that refers to “cattle,” is introduced by the tenor soloist in tones of righteous anger. Thus the pattern is set. The Mass texts are allocated to the main choir and orchestra with the soprano as the only soloist. The boys’ choir, from afar, accompanied by chamber organ, also sings only Mass words. The Owen poems are sung by tenor and bass soloists accompanied by a separate chamber orchestra. The War Requiem is full of symbols, some having to do with world and artistic politics, some arising from ecclesiastical/liturgical traditions, some just related to performance choices. The solo vocal parts were written specifically for a Russian soprano, a German baritone and an English tenor: Galina Vishnevskaya, Dietrich Fischer-Dieskau, and Peter Pears, representing the three European nations most affected by World War II. Of course, the very location of the first performance was a compelling symbol enough. The Soviet Commissar of Culture, Ekaterina Furtseva, gained a certain international notoriety when she declined to issue a travel permit to allow Vishnevskaya to sing at the premier: “How can you, a Soviet woman, stand next to a German and an Englishman and perform a political work?” She was right, of course. It is a political work! And what a one it is. But so much more. In the event, the fine English soprano Heather Harper learned the role quickly and filled in well. Vishnevskaya was permitted an exit visa for the first recording. Charles Dutoit is a master of his craft and of this work. This performance enjoyed the precision and control of his exemplary technique: cues apt, pacing superbly calculated, concept solidly musical and faithful to the score. This was controlled music making of the finest sort. No show-boating–so wisely human in concept and execution. And he was in extraordinarily fine company. The orchestral playing was of the highest BSO standard. That, of course, is high indeed. The chamber orchestra within the larger orchestra was especially fine. Their role, as accompanists to the tenor and bass soloists, who, between them, share responsibility for giving us Wilfred Owen’s blunt and beautiful messages about the horrors of World War I trench warfare, was spot on and responsive to the texts as much as the singers were. From the large orchestra also came a marvel of astounding playing throughout. Early on one felt like looking up to see if the ceiling was still in place as the brass took charge of things in the Dies irae. From all the orchestral sections this was playing of the finest Boston standard, which is to say of world standard. Britten’s international mix of solo singers was reaffirmed here. The Russian soprano Tatiana Pavlovskaya has become in recent years an established figure in the international opera world. Her mastery of the major Russian operatic heroines is secure. The classic dramatic soprano roles of European opera are also in her repertoire. At the beginning of Thursday’s performance, I felt she was trying too hard to convince us of her Russian credentials and risking perhaps too much in the process. The voice is big, very big. Not until the Lacrimosa section of the Dies irae did she win me over. Her pianissimo there was golden, touched with velvet and deeply in touch with both Britten and Verdi (whom Britten references here and in a number of other places in the Requiem). At that point I was converted. The fire we heard earlier, and later, was put in context. And I must say that her Latin pronunciation is worlds better than Vishnevskaya’s, who nonetheless set the table for interpretations of this role. Tenor John Mark Ainsley is at the very top of his game. He is among the very few who carry the gold standard of Britten interpreters these days. His mastery of the notes, the words, and the interior meanings at every moment—the musical and verbal nuances that are fully at his command—serve as a didactic example of how this part should be sung in the post-Pears generation. The Baritone Matthias Goerne is a noted singer of Lieder. I was impressed at the subtlety of much of his work in the Requiem. And yet, there was much missing. Why would such a sophisticated singer in the German language often be so careless about English vowels and especially dropped consonants, the latter, after all, being such an important element in German speech and singing? The voice is large, filling the hall with plentiful sound, and the communication of the musical and humanistic aspects was commendable. The American Boychoir was the offstage representative of an ancient liturgical tradition that is, in one sense, very much of the Requiem’s essence. How many generations of this choir have experienced both the challenges and triumphs of this work since 1963, when they sang in the BSO’s American premier of it under Leinsdorf? That experience shows; their singing was very fine indeed. Who was the real star of this show? I would nominate John Oliver. His work with the Tanglewood Festival Chorus just grows and grows and grows in excellence. One expected this chorus of over 100 singers to make a glorious noise, and it certainly did. But it was their pianississimos that blew me away; that and their enunciation throughout. The three magical a cappella F major cadences—concluding the Kyrie, the Dies irae, and In paradisum—each made up of exactly the same musical material, but each stretching farther and farther into infinity in their quietness and superbly clear articulation, were breath taking. That will live in my memory for ever. I can’t leave the chorus without also mentioning the splendidly understated Recordare and the spectacular virtuosity of the wickedly difficult Quam olim Abrahae fugue. And all from memory. A few more highlights. Goerne’s singing of his first solo, “Bugles sang…” the final line lingers in memory, especially the way the word “shadow” was mumured in the line, “Bowed by the shadow of the morrow, slept.” The soprano’s Liber scriptures was striking even if at the expense of some verbal clarity. Ainsley’s “Move him into the sun,” where the speaker hopes to revive his dead comrade by such a move: unspeakably beautiful. Owen’s retelling of the Abraham and Isaac story in which Britten uses some music from his earlier Canticle of that name; but in Owen’s telling the old man goes ahead with the slaying of his son…”and half the seed of Europe, one by one:” Devastating. In the Sanctus, Pavlovskaya’s Benedictus—wondrous soft singing, floating up again and again to a radiant high A, preceded and followed by the chorus and orchestra’s blazing D major Hosannas. The tenor’s addition of Dona nobis pacem (Grant us peace) in the Agnus Dei; in a stroke of genius, Britten added this line which is not part of the Requiem text. The baritone’s “None, said the other…” which was finely expressive and with better textual articulation; making it clear why this singer is such a fine Lieder singer. 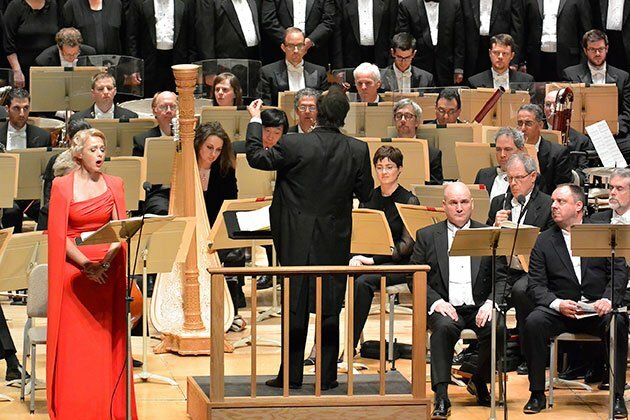 Thank you to the Boston Symphony for honoring Benjamin Britten’s 100th birthday in such an unforgettable way! In fairness, one must note that later in the same piece he expressed the hope that this judgment might be wrong. My purpose in citing this quote about a work that now seems so secure in its place in music history, is to assert that sometimes audiences know more than critics, and always get the last word. Donald Teeters retired in 2012 after 44 seasons as Music Director of The Boston Cecilia. He is organist-music director at All Saints Episcopal Parish in Brookline and a member of the music history faculty at New England Conservatory. It was a very satisfying evening at Symphony Hall, even though Owen was wrong in suggesting that there is no resurrection (if I understand him correctly). Don, Thanks for this insightful and informative review. There’s nothing there to argue with, though I was not in the audience. It was Ozawa’s 2000 performances of the piece that live in my memory, and it was then I thought that any chorus that could sing that loud and that soft was one I wanted to be part of. I finally did join up in 2009, and it is the privilege of a lifetime — a lifetime filled with extraordinary choral music-making — to be participating in these performances. There is no more fitting way to honor Britten. BTW, if anybody was at the Friday performance, I’d be interested to know how Jason Snider did with the Underscoring (hopefully much better than Michael Martin’s shtick at Tanglewood last summer). I’m out of town at a musicological conference, so I’m forced to miss the War Requiem, but I’m very happy to see Donald Teeters wonderful appreciation of this great work in the Intelligencer. I applaud Don for his insightful comments; In my 2nd balcony (preferred) seat, the sonorities flowed upward to me as only they can in Symphony Hall. I would point out that by good plannng or by happenstance the three soloists once again represented the three countries most affected by the war. But a firey red dress for this piece? Or was it supposed to have been symbolic of the blood lost by the Russians during WW II. I’d be curious to know what she wore for the Friday and Saturday performances? Black might have been better. I have heard the Britten Requiem 3 times now: once in UK in the late 60’s when I was young, once with Robert Shaw in NYC in the late 90’s, and now once with Dutoit and the BSO. My understanding of the work has grown each time. One listens to this piece, one does not enjoy it. Thank you Don for a wonderful review. I attended the Friday performance. First, I want to disagree with previous comments about the Underscore Fridays. I have heard a number of them and have enjoyed both the remarks themselves and the obvious affection of the orchestra for its own members. I did not hear Michael Martin at Tanglewood, but I did hear him in Symphony Hall and thought he was very amusing. Humor rarely replicates well, however, and I can believe that the Tanglewood talk was not successful. All that said, last night’s comments were embarrassing. The speaker–for his sake I will not mention his name–stated that the Requiem was commissioned by Serge Koussevitsky, long dead by the time Britten began writing the piece. The speaker must have become mixed up with Peter Grimes. And he appeared to think that Coventry is located in or near London (it is 100 miles away). He did not have anything particularly perceptive to say about the piece. I thought it was a superb performance. Thank you for the great review here. Jason’s Underscore talk was good, a bit on the careful side but for one gaffe (Coventry Cathedral is in Coventry, not London), and nicely delivered. The red dress did appear again on Friday — one more to go. As others have indicated, the red dress was back on Friday night (from the second balcony center it played off nicely against the red mallet hanging from the gong in the chamber orchestra) and the obligatory UnderScore talk, while not without its errors, was tolerable and over quickly. More to the point: unlike other UnderScore events, the full program was presented (presumably because there was nothing that could be dropped); but this is not the place to continue the campaign against the idiocy of this misfired attempt at audience outreach. The performance struck me as a stronger than Ozawa’s (though I recall that his had a stronger group of soloists, including Quasthoff and Bostridge), though I haven’t listened to the off-air recording in quite some time. From the first row of the second balcony center what was most immediately striking was the clarity and precision of the TFC: this was the first time I’ve been able to follow every twist of the Latin setting. The placement of the American Boys Choir off-stage in the second balcony was a stroke of genius (Ozawa, unless I’m misremembering, had them in the same general location, but seated in balcony itself). The result was a perfect realization of the otherworldly and — when they begin their chanting of the Hostias et preced tibi Domine at the close of the Offertorium while “half of the seed of Europe” is being slaughtered down below — discomfortingly disconnected sound that Britten must have wanted: Heaven is up there somewhere, Hell is down here in the trenches. The chamber orchestra was spread out around Dutoit, rather than segregated stage right, as it was in a BU performance at Symphony Hall a while back. I doubt that the spatial effect this sort of separation would have produced at Coventry works at Symphony Hall, but it did make the shifts from orchestra to chamber group less apparent visually (and what one sees sometimes influences what one hears). Dutoit put his own stamp on the piece, which is no small thing when confronting a work whose performance tradition has been shaped by the recording made by its composer. One small example: he favored a slightly faster tempo for the tenor segment of “Strange Meeting”, which may have added to the impact when Goerne began his contribution. Goerne’s English was, as others have noted, largely incomprehensible, which may have robbed those of who do not have the Owen poems already burned into their brains of some of the impact. But probably not: I spent a good hour talking with a friend who was hearing the work from the first time (lucky him!) and it was clear that he found this a deeply unsettling work. He was unsure of how to reconcile the Owen poems with Latin Mass for the Dead, even at those moments — notably, the Agnus Dei — when the two seem to move towards each other. At least as I understand the work, this was what Britten must have wanted. Among other things, the War Requiem is a requiem at war with itself: old rituals collide with modern horrors, the promise of redemption appears (most powerfully in this performance at that moment in the “Parable of the Old Man and Young” when the chance to end the horror is tendered) and is broken (Abram goes on with the slaughter), and when Heaven and Earth seem at last to have joined with the words “Let us sleep now” (words that, in the original manuscript of Owen’s poem online from Oxford, seem to have been written, but then either underlined or crossed out) we wind up back with a ritual intoning of the words that have failed, at every earlier point in the Mass, to console. Performances like last night’s drive home what a remarkable work this is. Thanks to a friend I was able to drive out from Schenectady and attend this performance. I am so glad I attended — one of CD’s finest conducting jobs, and I have heard him numerous times over the last 32 years. Everyone was wonderful, even the audience. This was my first concert at SH in four years and it was truly memorable.